After a bit of fuddling with the best method to interface with the Kinect for this project, I've found OpenCV to be the best C++ API for this task. OpenCV is an open source API used to display and manipulate image data. Its relatively light weight and not as obfuscated as the Windows API, which means I can complete whole tasks much quicker. Also I have chosen not to use OpenGL, as its pipeline adds additional complexity to how images are loaded from the video stream. My first implementations have been capturing and displaying color and depth frames from the device. 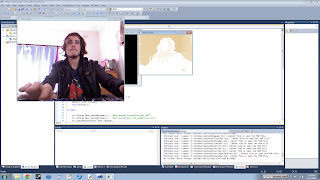 I have begun implementing OpenCV's face and eye classifiers to detect a face in the video stream, I have implemented the classifier, however it has not detected a face and I am unsure why. The main functions are the CVKinect::Init() Which begins the main loop, and the getColor/Depth/Face() functions. I am also using OpenCV2.3. Thanks for this example mixing Kinect SDK and OpenCV! I was struggling with this issue at this moment and it will help me a lot. If you want to detect faces with OpenCV check the "facedetect" example it already has. I recommend you to download OpenCV from SVN to get the cutting edge version. The reason your head tracking isn't working is that you are not loading, or initializing, the "CascadeClassifier"s. Try calling "aCascadeClassifier.load(pathToFile);" as the sample code referenced does. I had this exact same issue!